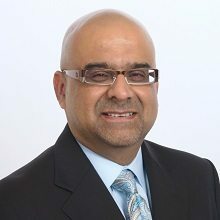 Deepak Hathiramani was the founder of Vistronix Intelligence and Technology Solutions, a national security solutions provider until its acquisition by ASRC Federal Holding Corp. in August 2016. He currently serves on the advisory board of several government contractors and is a member of George Mason University’s Volgenau School of Engineering Advisory Board, the University of Texas at Austin Department of Computer Science Advisory Council and the Northern Virginia Technology Council Senior Advisory Board. Each book gives me a different perspective. I always enjoy reading Michael Lewis, and “Flash Boys” was no exception. A book about a small group of Wall Street rebels who figure out that the U.S. stock market has been rigged to the benefit of insiders, “Flash Boys” is an eye-opening expose of the inner workings of Wall Street. “Russian Roulette” is a story of political deception unprecedented in American history — it weaves together tales of international intrigue, cyber espionage and superpower rivalry. “Everybody Lies” is a fascinating, illuminating and witty look at what the vast amounts of information now instantly available to us reveals about ourselves and our world — provided we ask the right questions! “The Five People You Meet in Heaven” promises to be a different read focused on the true meaning of life.